Just in time for Easter and Mother's Day, our deliciously light and fresh Lemon Chiffon Cake provides 8 to 10 servings of pure delight! 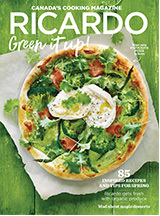 In our latest issue, we've got 85 recipes and tips to make our lives a little greener. Touché, coffee curators, and RICARDO join forces to create three exclusive full-favoured blends to epicurians' great delight. In our latest issue, we've got 63 cozy recipes and ideas to warm up to this winter. The most popular dessert at Cafés RICARDO, the Red Velvet cake, will be available exclusively at all IGA, IGA extra, Les Marchés Tradition and Marché Bonichoix stores for a limited time at the cost of $29.99. IGA once again stands out with an exclusive partnership, this time with Quebec’s favourite chef! In our latest issue, we've got 125 new and delicious ways to simplify the holiday season. Ricardo has chosen beautiful Quebec City as the site of the third RICARDO Boutique + Café! In our latest issue, we're helping you refuel for fall with energy-boosting recipes and tips. In our latest issue, we're helping you save time with simple tips, tricks and recipes...just in time for the busy back-to-school season! In our latest issue, beat the heat with our tasty summer recipes!